In last one decade, the dynamics of event industry have changed due to the expansion of event celebrations as well as the higher expectations from the clients, which eventually put the event planner’s managerial skills to test. It became inevitable for the event planners to remain observant on the periphery of the events while controlling them from the central axis. Event planners today, require a wide range of multi-tasking solutions, that helps them in managing their events individually. A quick solution that drives value to their events without adding any complexity. Fortunately, technology has entered at the right moment as a saviour for the event planners in the form of event-software and mobile applications. Especially, mobile app helped event planners to envelop all their business activities into one single dome. A survey by one of the U. K’s leading event portal indicates that there is a rise in the use of mobile application among event professionals. Various event apps float in the market, but in real sense, only handful of them meet the objective of the event planners. Usually, mobile apps are overloaded with functionalities and often requires technical knowledge for its usability. It is difficult for event planners to scrutinize each of this feature to check it’s working. It is therefore recommended that event planners should first do a detailed analysis regarding its requirement before installing any application. There are various aspects where event applications can help Event Planners. But remember app should make managing an event a pleasure and not vice versa. It has to be simple and easy to operate such that it becomes second nature to event planners. 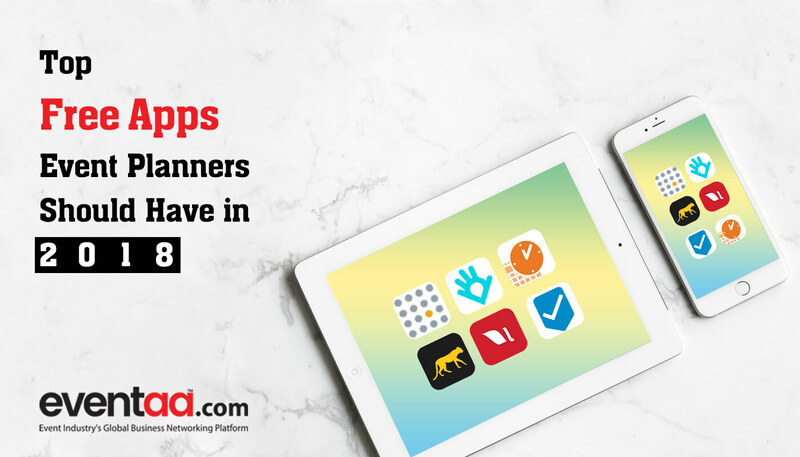 To make this sorting easy here is the list of few apps in aid of event planners. This application is like a master key to all the locks. It does everything for event planners right from organizing an event, selling tickets to brand promotion. Eventleaf is the event management application that will help you with following things. The tool allows free usage for first 50 attendees and up to 5 exhibitors. · Add speakers, exhibitors and sponsors that will be appearing at the event. Wave's software is 100% free. The basic version of this App is free. · Organize a meeting date and time Without the hassle of lengthy email chains, time zone conflicts, or endless phone tag. · View meeting comments and respond all from one. · It eliminates the need to transport physical products to trade shows drastically reducing the product transportation expenses. · Users can interact with products from every angle, explore options and features. Live events are making buzz in all kind of events. No event exhibitors or event planners would like to miss out on this opportunity especially on their event promotion. · Simplest and best way to telecast HD live video from your mobile device or tablet through "Livestream"
In case, if your mobile allows you to download few more extra apps then below apps are surely to put bets on. It will let go your event-stress and relieve workload to a great extent. These apps are paid ones but are available at basic price. This application is awesome and give wings to your imagination to design event virtually. It is not free but available at nominal price. · It enables you to design 2D and 3D interactive floor plans, buffet diagrams and seating arrangements. · Virtual 3D walk-through for an in-person experience. · Input guest names to seating arrangement and entree selections. Glisser is an award-winning presentation software and integrated audience response system. · You can add interactive features to engage audience like live polling, digital Q&A, Twitter walls, etc. and then share slide with the audience to take part in the live events or presentation. · The app will give audience live feedback and put their viewpoint to presenter without disturbing. Connect and track your audience in real time. · It is specifically built for live events to see audience interaction like travel time, number of occupants, etc. It helps to save the time invested during and after event activities. · Delegate directory - easy to find any delegates during exhibition. Also, through directory it will be easy to find their details like company name, email address, location, etc. Some other mobile apps that are popular among Event planners are Grenadine and Conrego. Help your friend choose the right app. The above apps could help your event planner friends to fill the operational gap in their event business. It could be done with a small act of sharing or even a chat during coffee break. If there is any app that you think should be mentioned above, we are pleased to receive it here. Our readers are highly receptive to any unheard event brief – regardless of how big or small it is.